Fast and Fluid Cover Flow. Visualization Effects bring the screen to Life – 11 Effects to choose from or Random Mode. Online Mode to Support Music Match. Ten Band Graphic Equalizer with Onscreen Visualizations. Graphic Equalizer presets including Rock, Pop Etc. 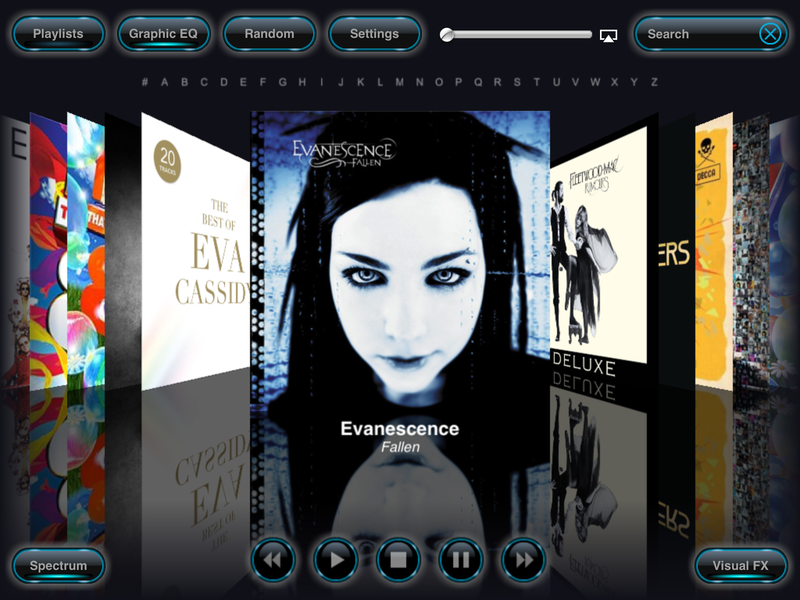 Use your iPad Play Lists or Create New Play Lists in Reflection. Add/Remove and Shuffle your current Playlist. Search by Artist Name, Album, Genre etc. Alphabetical Indexing and selectable sort order. Shuffle and Random options for the playlists. Digital Clock and Alarm Mode – Wake up to your Favourite Tracks. Combine Airplay and Mirroring to your Apple TV to stream Reflection to your big screen TV and Surround Sound System for awesome sound and effects. Reflection has never been this much fun….